On some future visit to your neighborhood supermarket, at least a few of the groceries you pick up for that night’s dinner party or the next day’s lunch will have been designed with artificial intelligence (AI) — or so thinks IBM. The Armonk, New York company today announced that it’s teaming up with McCormick & Company — the century-old purveyor of spices, seasoning, mixes, and condiments for industrial and home kitchens alike — to create new flavors and foods with machine learning. The collaboration — which IBM says was four years in the making — will see McCormick & Company tap IBM’s Research AI for Product Composition tech for AI-derived insights, which IBM claims has already enabled the food company’s Consumer and Flavor Solutions divisions to discover new herb, extract, marinade, and stock flavor combinations up to 3 times faster. The recipe-predicting AI, drawing on McCormick’s proprietary “hundreds of millions” of data points across sensory science and flavor palettes, will fuel the launch of its forthcoming product family — One — which it expects will launch in mid-2019. Flavor is a tough nut to crack. As IBM explains in a blog post, it’s a tug and pull between at least three senses — smell, taste, and appearance — that interact in often unpredictable ways. Genetics plays a role. Exacerbating the challenge is the fact that five of the taste areas with which our tongues are mapped — sour, sweet, salty, bitter, and umami — can be detected by all of the roughly 10,000 taste buds on the tongue, in the oral cavity, and in other locations. So what’s a product developer with tens of thousands of ingredients at their disposal to do? Traditionally, spend years experimenting with ratios and samples until they become proficient at combining them. With IBM’s system, they no longer need to. Above: One of the new McCormick products developed with IBM’s AI. The IBM-developed algorithms learn and predict a wealth of useful combinatorial info, including raw material substitutes, ratios, human response, and the relative novelty of a formula. Armed with this data, McCormick says its food scientists can explore previously hard-to-detect nuances in the flavor of ingredients (like vanilla beans sourced from different regions), and seek out new flavors that would’ve been too laborious to source previously. 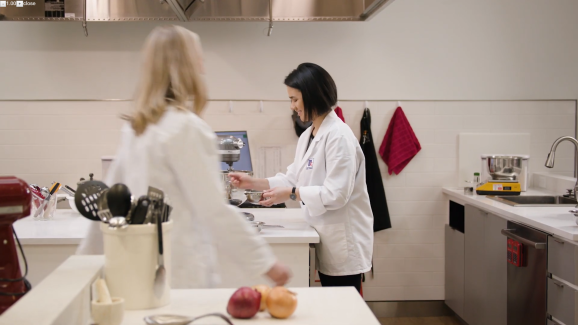 The first of McCormick’s AI-informed foodstuff to hit store shelves will be one-dish Recipe Mix flavors, like Tuscan Chicken, Bourbon Pork Tenderloin, and New Orleans Sausage. They’re expected to launch in late spring, ahead of One’s global expansion to 20 labs in 14 countries in 2021. Meanwhile, companies like Los Angeles-based Halla’s I/O platform use AI to generate Netflix-like recommendations for grocery, restaurant, and food delivery apps and websites, in part by leveraging a database of restaurant dish, recipe, ingredient, and grocery item taste and flavor attributes. Others, like Foodpairing, Plant Jammer, and Dishq, have proprietary recommendation systems that take into account personal preferences. Still, the McCormick deal is a potentially lucrative new revenue stream for IBM’s Research AI for Product Composition business, which last year collaborated with Symrise, one of the top global producers of flavors and fragrances, to create an AI system — Philyra — that sifts through formulas and materials to identify novel fragrance patterns. IBM says it’s also capable of coming up with new detergents, adhesives, lubricants, and construction materials. Orbis Research expects the global AI market in the food and beverage industry to grow at a CAGR of 42.18 percent between 2017 and 2021.